Will Sales Growth Continue for India Inc? The last few quarters have been challenging for Indian companies. Today's chart of the day, clearly highlights this. The sales of companies in the Nifty 50 index declined for most of 2015. The growth in the sectors like metal, pharmaceuticals banking and capital goods particularly came under pressure. However, Since the start of 2016, there has been a stark shift in the trend. The first sign of topline growth shifting towards positive trajectory was seen in the March quarter. But how will things move going forward? Well, a regular 5 Minute WrapUp reader has undoubtedly read about Rahul Shah's prediction that the earnings of Sensex companies could go up as much as 70% in two to three years. But when it comes to selecting stocks that can benefit from the upside, one needs to be selective about not just the sales growth but the sustainability in profit margins too. We published a special report - Sensex 40,000: 4 Stocks to Profit from the Coming Stock Market Wave - to talk about exactly such opportunities. Equitymaster requests your view! 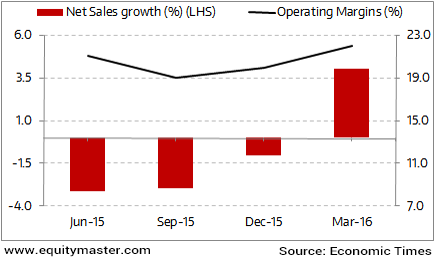 Post a comment on "Will Sales Growth Continue for India Inc?". Click here!